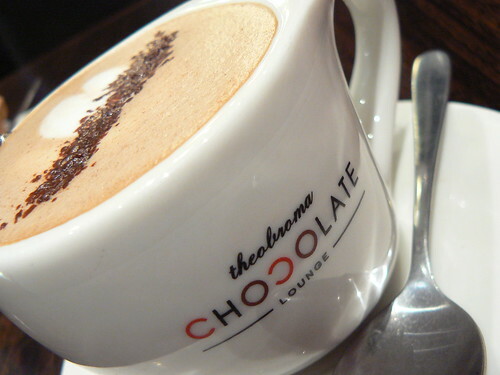 At Theobroma at St Luke’s the other day I had this soy hot chocolate. They do an interesting chilli hot chocolate, too, and if you get a big one it comes in a mug with a candle underneath it. Chocolate and open flame — a truly Betty combination. It’s not a perfect chocolate: it mostly makes me wish there was a Koko Black or even a Max Brenner in the country, but nonetheless, chocolate does the trick. This entry was posted in Food and tagged chocolate, Koko Black, Max Brenner, st luke's, Theobroma. have you seen the movie, Chocolat? she placed a teaspoon of chili in hot chocolate and i’ve been curious about ever since. sounds really delightful and i have to try one of these days. this is a pretty photo, betty. i love the the foam heart. I haven’t seen Chocolat, but I think I need to remedy that soon! Chilli in chocolate is incredible. Lindt make a block of chilli chocolate that’s really good, and I have a recipe for Mexican chocolate cupcakes that’s yummy. Let me know if you try it! Oh that looks so good. I love Mexican Hot Chocolate with a little kick to it. I’m always trying out different places and different types during the winter.